The only business left in Dryden during our visit was a combination grocery/post office that is was sparsely stocked as the county’s population. A reader reported in 2013 that it had closed. Another reader reported it was open again in January 2017. Photo by Kathy Weiser-Alexander, February 2011. 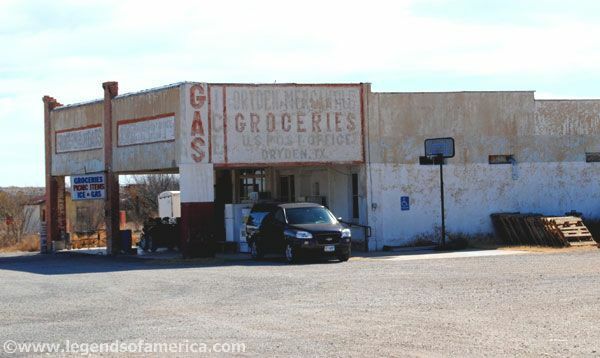 Tiny little Dryden, Texas, population about 13, is one of just two communities in Terrell County, which sprawls across 2,358 square miles in the Chihuahuan Desert of southwest Texas. Like Dryden, the county, comprised mostly of large sheep and cattle ranches, is sparsely populated, with only about 1,100 people calling it home. 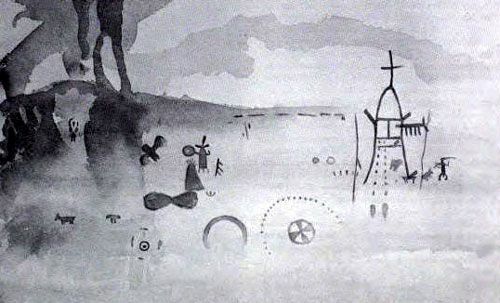 Long before any settlements were established in the county, a number of Native American tribes roamed the region, leaving behind much evidence of their lives including arrowheads, tools, pictographs on cliff walls, and caves where burials have been found. The earliest exploration of the area was made by Spanish Captain Jose de Berroteran in 1729 when he commanded an expedition to explore from Mission San Juan Bautista up the Rio Grande River to the mouth of the Rio Conchos. Captain Samuel Highsmith, under the command of John Coffee Hays, crossed the county in 1848 in an expedition to open a road from San Antonio to El Paso. Under Lieutenant William Echols in 1859, caravans of the U.S. Camel Corps crossed the county searching for a shorter route to Fort Davis. Both Dryden and the county seat of Sanderson, just 20 miles to the northwest, were founded when the Galveston, Harrisburg, & San Antonio Railroad, was built through Terrell County in 1882. The settlement was named for Eugene E. Dryden, the chief engineer of the railroad. The small town, which began with only a railroad section house soon became the center for several ranching-based businesses, including the Pecos Land and Cattle Company, which was established in Dryden in 1884. 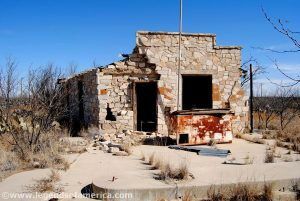 By 1886 W. W. Simonds, manager of the Pecos Land and Cattle Company had built a large frame building for a post office and a store, as well as two adobe houses as residences for the Simonds family and the ranch foreman. The company also drilled a water well, which supplied the town. A post office was established in 1888. The following year, a man named Beverly Carter Farley came to work for the Pecos Land and Cattle Company, remaining with them until the company was sold in 1895. He then bought several sections of land and ranched on his own. In 1908, he built the Dryden Hotel and a store. Four years later, in 1912, a combined schoolhouse, community center, and church were built to serve the community. 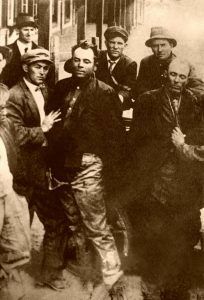 One of the biggest events in the area occurred on March 13, 1912, when one of the last train robberies in Texas occurred. On the evening of March 12th, the Galveston, Harrisburg, & San Antonio Railroad Train No. 9 pulled away from Del Rio, Texas with engineer D. E. Grosh at the throttle at about 8:00 p.m. Shortly before midnight, it stopped in Dryden to take on water and as it was preparing to pull away, outlaws Ben Kilpatrick and Ole Hobek climbed aboard the engine. The masked men then ordered the engineer to proceed to the first iron bridge east of Baxter’s Curve, which is about halfway between Dryden and Sanderson. There, the bandits ordered the train to be stopped and the passenger cars and caboose to be uncoupled from the engine, mail, and baggage cars. Without the passengers, the engine then went across the bridge and about half a mile further down the tracks, where the robbers had horses waiting, ordered the train to stop again and proceeded with the holdup. Whole Ole Hobek stayed with the engineer, Ben Kilpatrick went back to the baggage car with David Trousdale, the Wells-Fargo express agent assigned to the train. When the pair passed by a shipment of iced oysters, Trousdale picked up an ice mallet and hid it in his clothing. Kilpatrick then filled a bag with about $60,000, but, as he was preparing to leave, Trousdale struck him on the head with the ice mallet and killed him. The express manager then armed himself with the bandit’s gun and when Hobek grew impatient and came looking for his partner, Trousdale shot him. The official time of the robbery is listed at 12:05 a.m. Afterward, the engineer backed up the train, re-coupled the passenger cars and continued on to Sanderson. Agent Trousdale helped unload the dead bodies and turned over the six weapons the robbers had been carrying. The dead bodies of Ben Kilpatrick and Ole Hobek were held up for photographs and were later buried in a joint grave at the Cedar Grove Cemetery in Sanderson. Ben Kilpatrick, also known as “The Tall Texan,” had previously ridden with the Wild Bunch led by Butch Cassidy, as well as with Thomas “Black Jack” Ketchum. Ole Hobek was also known as Ed Welch, Ed Walsh, and Ed Beck. It is believed that Ben and Ole met at the Federal Penitentiary in Atlanta, Georgia where they were both serving time for robbery. Kilpatrick was released in 1911 after serving ten years of a 15-year sentence for participating in the Hole in the Wall Gang robbery of the Great Northern train outside of Wagner, Montana in July of 1901. Wells-Fargo Agent, David Trousdale, was awarded more than $2,500 and a gold watch for his bravery. The next year saw more excitement for tiny little Dryden when two units of U.S. Troops were stationed there due to the Mexican border unrest of the Mexican Revolution. Despite the border troubles, Mexican ranchers continued to bring their cattle to Dryden for shipping, receive mail, and to shop for supplies. The locals were accustomed to Mexican visitors. The soldiers would stay until 1917. The Block Y Ranch, located in San Antonio, also moved part of their operations to Dryden in 1917 and started shipping cattle. As employees were relocated, houses and a headquarters building were built. Ranch owner, Julian Marcus Bassett; however, was not much of a success and moved to Gila, New Mexico in 1928. However, he returned in 1930 and operated a store through the end of the decade. Old gas station in Dryden. Photo by Kathy Weiser-Alexander, 2011. By 1929 the population was 100 people but during the Great Depression the railroad closed the depot and moved its crews. As a result, many of the large area ranches broke up and sold out. With automobiles, local ranchers could drive to larger towns for supplies and by the 1930’s Dryden had dwindled to just 50 residents and three businesses. It regained some population by the end of the 1940’s but dropped again by the 1960’s, when it still reported two businesses and 50 people. All that remains is today is about a dozen people and general store, that is as sparsely stocked as the county’s population. About 12 miles north of Dryden is a historic oasis in the desert called Meyers Spring. The spring, sitting in the midst of a dry rocky terrain, has been used by people since prehistoric times. At the spring is a rock shelter whose walls are covered with Indian pictographs. The spring breaks out from a bluff wall about 30 yards above the shelter. Thought to contain pictographs of several indigenous peoples, dating back as far as 3,000 years, the site was added to the National Register of Historic Places in 1972. A copy of Meyer Spring pictograph made in 1935. The pictographs are considered some of the most valued in North America and represent examples of at least three different time periods. Arrowheads and other workings found at the spring date from prehistoric to historic periods. In more recent history, the Comanche were known to have used the spring as a hunting camp in the fall for several months until the late 1870’s. 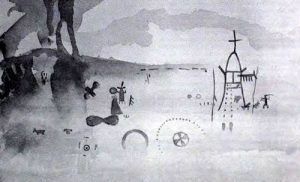 Some of the pictographs portray a number of fights they had with the Apache. The pictographs also show early Spaniards who tried to institute Christianity, with images of a priest and a church. The spring was also intermittently garrisoned by U.S. Army troops out of Fort Clark in Brackettville, beginning in about 1873. For years it mostly consisted of a tent campsite, but, in about 1880 became a more permanent camp when about 15 one-room adobe huts were built. The most well known of its army occupants were the “Black Watch” which was comprised of Black Seminole Indian Scouts led by Lieutenant (later Brigadier General) John Bullis. The scouts patrolled the area to protect the water supply and area settlers from Indian attacks. They were also instrumental in leading cavalry forces to the Indians. A settler’s stone house was also built nearby in about 1884. Troops evacuated the site in 1885. Bullis returned to the spring some 20 years later and erected a water tank, which still stands today. The Camp Meyers site was excavated in 2007-2009 by Texas Tech University. The Bullis Camp Site is also listed on the National Register of Historic Places. Both Camp Meyers and the pictograph site are on private land called the Meyers Spring Ranch. Tours are available several times throughout the year through the Rock Art Foundation, located in San Antonio, who works in stewardship with the landowner. At the time of this writing, the 19,000 acres Meyers Spring Ranch is for sale, if you just happen to have some $6.5 million. Situated on the Pecos Heritage Trail, Dryden is located on U.S. Route 90 at the intersection with State Highway 349, about 100 miles northwest of Del Rio.